I remember feeling kind of guilty while my husband and I stumbled onto the street later that night to flag down a cab, so I decided to write up a list of the best tips all new moms should read before they enter parenthood. Once you start sporting a baby bump, the ENTIRE WORLD will have an opinion they can’t wait to share with you, and it will only get worse once that child is out of your body. Especially if you admit to sleep training your child. But once you learn the art of selective hearing, your life will get so much easier. Trust me on this one. Everyone will tell you to ‘sleep when the baby sleeps’, and it will become the most annoying phrase you’ve ever heard in your entire life. But if there’s one thing I could change about those first few months of motherhood, it’s the amount of time I spent being a martyr and doing everything EXCEPT laying down for a much-needed nap on the rare occasion my daughter let me put her in her crib. The bottom line is that the vacuuming and the dishes and the toilets can wait. Your well-being cannot. And not everyone can do it. But guess what? There’s nothing wrong with giving your child formula (allergies permitting), so if you aren’t producing enough milk, can’t handle the pain, or simply don’t feel comfortable with it, the world will not end if you opt to bottle-feed. And if someone has a problem with your decision, refer to # 1. You know the whole, ‘it takes a village to raise a child’ saying? Well, it’s true. So I strongly recommend you do the exact opposite of what I did during the first few months of parenthood. Invite people into your home, let them hold your baby while you shower, ask them to pick up groceries for you when you can’t get out of the house, and remember that they wouldn’t be offering you help if they didn’t genuinely want to give it to you. My daughter was almost one before I felt comfortable enough to leave her alone with my husband, and she was almost 2 before we dared to leave her with a babysitter. And while both of those events were scary, the freedom they gave me did wonders for my well-being, and I regret that I didn’t allow myself a little adult time sooner. I now make it a point to get out at least once a week by myself, even if it’s just to buy myself a pack of tampons, and I lock down our babysitter for one Saturday a month so my husband and I can enjoy some couple time.It makes SUCH a difference. For some stupid reason, my husband and I were too scared to take my daughter out of the house when she was born, so I didn’t leave the house FOR THREE AND A HALF WEEKS. Do you have ANY idea what that does to a woman with postpartum hormones coursing through her veins? It wasn’t pretty. So, unless there’s a medical reason you have to stay indoors, I highly recommend getting outside at least once a day. And if you can swing it, sign up for a mommy-and-me class, too. The change of scenery and interaction with other moms will do wonders for you. I know, I know. When you’re up 4 times a night dealing with a colicky child, the LAST thing you want to do is spend more than a nanosecond on the treadmill, but I can tell you from experience that the movement will do wonders not only for your energy, but for your self-esteem. Just make sure your doctor is on board before you start exercising again. One of the things that scares me the most about having another baby is the idea of developing another case of the baby blues, and that I won’t be able to lift myself out of it. It took me a long time to get back to my old self after my daughter was born, and while I never felt like I had true PPD, I’m the first to admit I could have benefited from a little bit of help from my doctor during the first year of motherhood. So if you feel like the initial hormone-induced baby blues aren’t going away, do yourself (and your husband!) a favor and mention it to your doctor, K? Whenever I feel unsure about something and call my husband in a panic, he says, ‘what does your gut tell you?’ Admittedly, this irritates me. Why do all of the decisions fall on my shoulders? But experience continues to prove to me that your gut is very rarely wrong, especially when it comes to your child. Being a parent is the hardest job you’ll ever have. There will be days when it seems as though life does nothing but throw lemons at you and it’s all you can do to keep it together until bedtime. And then, just when you reach your breaking point and start reaching for the wine as soon as you roll out of bed in the morning, things will get better. Not easier. mind you, but better. And you’ll suddenly find the strength to make it through to the next rough patch. 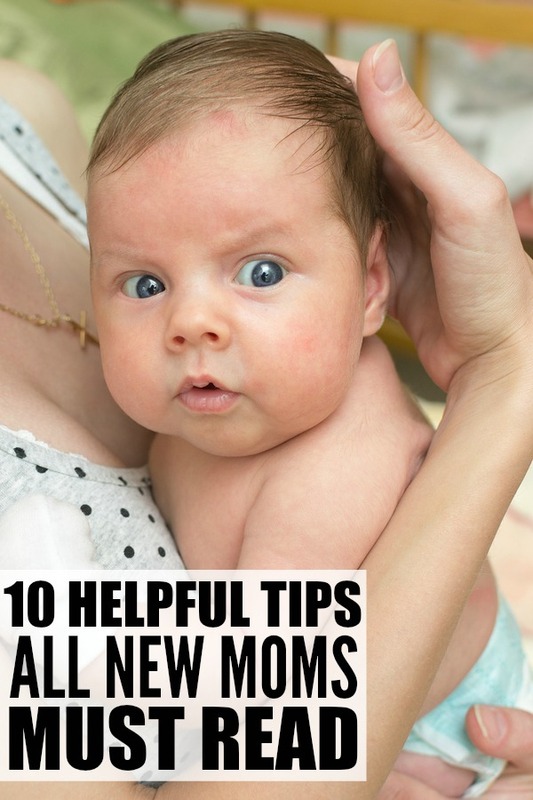 If you found these tips for new moms helpful, please share them on Pinterest! And if you’re looking for more parenting advice, please follow our Parenting board where we share all kinds of great tips and tricks! front page and watch how they create article headlines to get people to click.